Hackers temporarily took over the Twitter account of the Bahraini foreign minister on Saturday, just 10 days after a cyber attack on the official news agency of neighbouring Qatar. The hack, which purported to be carried out in the name of a fringe militant group, came after Bahraini authorities dissolved the kingdom's last major opposition movement and after police shot dead five protesters while dispersing a long-running sit-in. 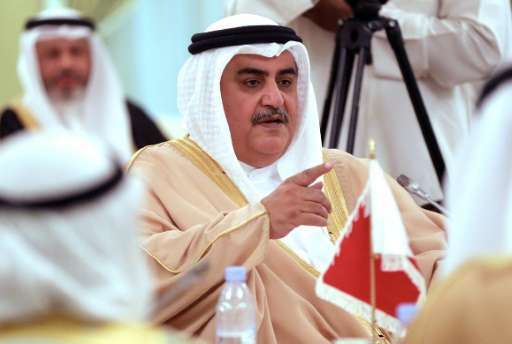 Foreign Minister Khaled bin Ahmad al-Khalifa, a member of the royal family, tweeted he had recovered his account four hours after images of bloodied bodies, demolished mosques and what appeared to be a child's illustration of war rolled down his official Twitter page. The foreign ministry confirmed the account had been recovered Saturday and blamed the attack on a "terrorist group", vowing to "hold accountable the individuals behind this despicable act". Saturday's hackers tagged their posts with the name and logo of Saraya al-Mukhtar, a Shiite group with a strong online presence, and made open threats against the ruling Al-Khalifa family. "We take an oath before you—we demand the execution of King Hamad," one tweet said.